A failed footballer who posed as a Chelsea star to live a Premier League lifestyle has been jailed. Manchester Crown Court heard Medi Abalimba went on a £20,000 shopping spree at Selfridges, stayed at top hotels and even hired a helicopter. The player, who once commanded a fee of more than £1m but whose career failed to progress, masqueraded as France youth international Gael Kakuta. Medi Abalimba, 25, admitted multiple frauds and was sentenced to four years. Abalimba, of Burton Street, London, phoned venues claiming to be the agent of Chelsea winger Gael Kakuta before turning up posing as the player. The court was told he would ring a venue advising of the imminent arrival of an elite sport star, requesting discretion and paying for goods with stolen credit card details. Abalimba obtained the details by photographing American Express cards he found in lockers he broke into using a master key at a gym in Camden, north London. In June 2014, he visited a Manchester nightclub and ordered £2,600 worth of champagne while claiming he left his wallet in a limousine. He pre-paid more than £2,000 using stolen credit card details telling staff he would return next day, which he did, ordering more champagne and leaving in a chauffeur-driven Bentley GT. In July, he ordered more than £20,000 worth of clothes in Selfridges in the Trafford Centre, even displaying his football skills while shopping - but store detectives were suspicious. His crime spree saw him stay at expensive hotels, dine at fine restaurants and, on one occasion, he even took four women from Manchester to London in a helicopter. Greater Manchester Police tracked him down to an £800-a-night rented mansion in Berkshire. 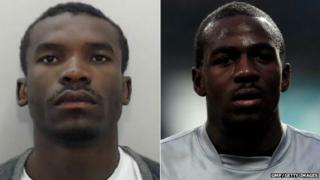 Sgt Adam Cronshaw of GMP, said Abalimba was "charming and charismatic" and could call on his previous football experience and "some resemblance to the real Gael Kakuta to deceive his victims". He added: "Abalimba told us that many of his victims treated him so differently because they thought he was a celebrity footballer." The player had stints with Derby County, Oldham Athletic, Southend United, Fulham and Crystal Palace and, as a youngster, had trials with Manchester City, Manchester United and Liverpool. He admitted 12 offences of fraud and dishonesty, in London, West Yorkshire, Manchester and Derby and asked for 19 offences to be considered. Speaking in mitigation, his barrister Vic Wozny said Abalimba had had a "rough upbringing" and that he "ran with the wrong crowd" after coming to London at the age of five. He said his footballing success had come with a lot of "hangers on", who Abalimba would spend his wages on. When Abalimba "started to slide and money dried up, my client could not accept that he did not continue to lead the high life", he said. "The offences started to happen. Thereafter my client's difficulties snowballed." Gael Kakuta, 23, joined Spanish team Rayo Vallecano on loan for the 2014-15 season.